I met April Kim many years ago in Sedona, AZ. She was a very sweet, unassuming and gentle woman. I immediately felt a sisterly bond with her, and was very sad to learn that she would be leaving town soon. Through the years we came to know each other through emails which we exchanged, exposing our hearts and souls bit by bit to each other, finding out that we had many things in common. However, little did I know, so many years later, what I would learn about this beautiful woman and her journey. One day in March 2014 I received an email from her asking if it would be okay for her to send me a little gift that reminder her of me. "Well, of course!" I replied. Like a child at Christmas I opened my P.O. Box in Cottonwood, and saw the little package inside. It was covered with stickers of puppies and pieces of Bacon! I laughed out loud as I pulled out my gift: a pair of socks with the word "BACON" printed on each side! What a wonderful, playful gift! I couldn't stand to put them out of sight, so I immediately hung them on my office wall, along with the heartfelt note to me that April included with the gift. But, the greatest "gift" was yet to come. In response to my joyful acknowledgement of my present, April sent me an email and casually included a photo of a painting she had created, and the story behind it. I read the story and cried and laughed and sat in awe at the wonder of it all. I'd had a very similar experience in my life as well, and her painting, though related to a moment in her life, completely captured the emotion of that similar moment in mine. Please read on for a truly inspirational story about faith and manifestation. 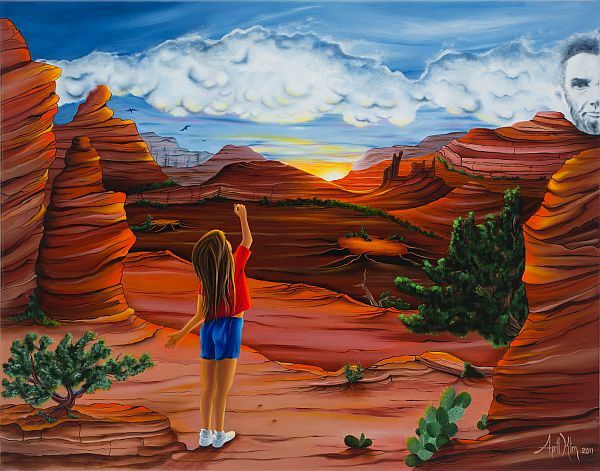 This painting depicts a true story about appreciation, Sedona Arizona, being homeless and three pennies. In 2003 I had been living in Sedona for about 4 years. Being the Gypsy that I am it was simply time to move on, however I had just returned from a 2-month trip to Europe and I was broke and homeless. I did, thankfully, have a job and a car. One afternoon as I was entering a convenient store with toothbrush in hand, I looked down and saw three pennies on the ground. Without hesitation I eagerly and joyfully picked them up, held them to the sky and said out loud; “Thank you God for the Abundance!” I paid no attention to the odd looks I received and went about my business. That evening as I laid the seat back in my old red Beretta, I pulled a blanket over me, getting as cozy as I could, petting my faithful happy doggie in the seat next to me. I looked out my window at the last bit of sunset kissing a glow on the red rocks of Sedona. I thanked the heavens for sharing such beauty, for my car, my dog, the clean clothes folded neatly in the trunk and for the beautiful tree nearby that allows me...and my little doggie, to faithfully water it each morning. In this state of such gratitude I remembered the three pennies, so I dug them out of my pocket and held them in my hand knowing there is abundance available to us in a state of appreciation. The prayers were sincere, the gratitude authentic. This peaceful acceptance and appreciation remained with me and about two weeks later things were about to shift dramatically. At this time, only a close co-worker knew I was living in my car and certainly not any of my customers knew. So one day at work, as a cashier in a health food store, a woman came through my line, as I was ringing up her grocery’s she slowly pushed a envelope across the counter and said; “I was inspired by spirit to give this to you, I’m not sure why, but the message was very clear, here, please take it, it is for you to keep, do not re-pay it.” I smiled, thanked her, thinking perhaps it was a bit of cash for lunch? Oh goodie I thought; I could get something from the deli at my break. Later I opened the envelope and inside, to my amazement and delight was several cashiers’ checks, all with my name on them. The sum of the checks totaled $3000. I couldn’t help but stop and think of those three pennies. I still have those same pennies today, tucked away and always, always when I pick up pennies, I hold them up and thank the heavens. Yes, I did move on, still grateful of the magic of Sedona and the memories of peering out my car window under the clear starry nights I called home, knowing that appreciation of the little things in life creates pure abundance. Happy manifesting to you!